Maximixer from ARDE Barinco is more than just a high-volume batch processor capable of varying amounts of shear. It's an integrated system that lets you gather, analyze and control key process parameters. Mixing at multiple viscosities with three different mixers gives the Maximixer the ability to disperse and emulsify with high shear, efficiently blend with high pumping capability and move and scrape high viscosity materials from the process vessel walls. The Maximixer system consists of three main components: a process vessel with three independently controlled mixers; an instrument panel that controls the temperature as well as the speed and direction of the mixers; and a personal computer that records key parameters you can use to ensure maximum efficiency and successful scale-up. Because it provides precise control over the entire process, the Maximixer system can disperse, emulsify, blend, heat and cool even the most critical multi-component products. It's versatile enough to handle a wide range of viscosities from, fine-grain creams and lotions to toothpaste and hair gel. And, like most ARDE Barinco products, it can be custom-built to meet your specific needs. At the heart of the Maximixer system is ARDE Barinco's exclusive Reversible Homogenizer for high-shear batch processing. By pumping up and down, this unique mixer can incorporate powders, disperse volatile fragrances and deaerate high-viscosity mixtures quickly and evenly. It provides thorough top-to-bottom mixing even in tall, thin process vessels, so there's no need to purchase costly large-diameter vessels that take up valuable floor space. 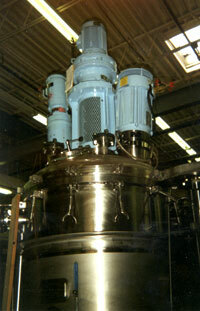 The second mixer, a scraped-surface agitator, gently mixes shear-sensitive materials. The third, auxiliary mixer can be any one of a variety of different types. ARDE Barinco will install the one that's right for your application. By varying the speed and direction of the three mixers, you can achieve four separate modes: dispersion, homogenization, deaeration and cleaning. The reversibility of the mixers provides several major operating advantages that translate into savings of time, power consumption and operating costs. Maximixer systems can be supplied with a data collection system that measures important parameters including RPM, power consumption viscosity temperature and pressure. These parameters provide the necessary inputs for successful scale-up calculations. The Model MXM-100 MAXIMIXER in the ARDE Barinco test laboratory is equipped with this data collection system so that small scale successful demonstrations can be performed while carefully collecting information on the power and shear required for the process. This information can be used by ARDE Barinco engineers to correctly calculate the required mixing time in larger batches. 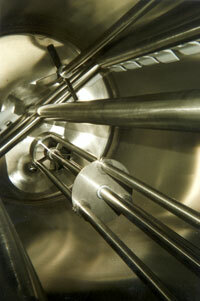 New Maximixers are designed with the required specifications for your specific process. ARDE Barinco process engineers do not try to fit a previously designed machine into your process requirement. All of the various specifications including material of construction, surface finish, pressure requirement, electrical specifications including voltage, and local electrical codes, floor space requirements and accessories are determined through a cooperative process between ARDE Barinco and the new owner of the Maximixer system.